Honeywell 1250g - Keyboard wedge kit with stand. Includes 1D laser scanner, 9.8" coiled PS/2 cable, 5V power, stand and documentation. Color: Black. Non-Cancelable/Non-Returnable. 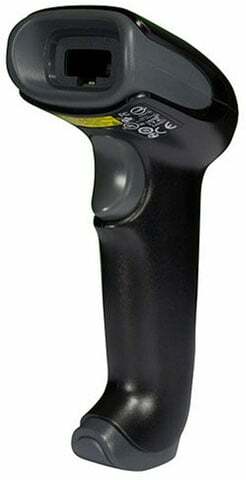 The Honeywell Voyager 1250g handheld laser scanner is optimized for fast scanning of linear barcodes, including poorly printed and damaged codes. The Voyager 1250g features an extended depth of field, letting users can out-of-reach items with ease. It supports all popular interfaces in one device, replacing the time consuming process of scanning programming barcodes. CodeGate enables users to ensure that the desired barcode is scanned before transmitting data, making the scanner ideal for use in menu scanning applications. Set-up is simple, and the Voyager 1250g's ergonomic design fits comfortably in most hands, reducing user fatigue in scan-intensive applications. The Honeywell 1250G-2KBW-1 is also known as MET-1250G-2KBW-1	or 1250G2KBW1	.